The timeline for approving Provo City's budget is set by Utah State Code. The Mayor presents the proposed budget to the City Council at their first meeting in May. (This year it is the May 1 meeting). Council votes to tentatively adopt the proposed budget. This vote will occur at the May 15 meeting. All municipal final budgets must be adopted before June 22, or, in the case of a property tax increase, before August 17. The Council's vote on adopting the budget will happen at the June 19 Council Meeting this year. The tentative (proposed) budget is available to the public at least 10 days before the adoption of the final budget. You can view the proposed budget in person at the office of the City Recorder. It is also available online. Budgets from recent years are also available on the Finance Department's website. A public hearing must be held before adopting the budget. The dates for the hearings will be formally set when the budget is tentatively adopted on May 15. According to Utah State Code, "All interested persons in attendance shall be given an opportunity to be heard, for or against, the estimates of revenue and expenditures or any item thereof in the tentative budget of any fund." UPDATE - public hearings will be held at the June 5 and June 19 regular Council meetings. If a property tax increase was included in the proposed budget this year and Council decides to move forward with the increase, a Truth in Taxation hearing would be required. The date for the hearing is set by Utah County and would most likely be held in August. In between the Mayor presenting the budget and the Council adopting the final budget there are usually some extra Work Meetings where Council Members examine the budget in greater detail, ask questions of department directors, and hear presentations and analysis from Council staff. 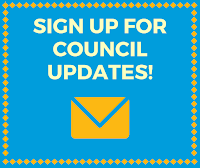 Watch the Council's Facebook page for updates. The Fire Department received a new fire engine in February. It is customary to surplus the oldest engine in the fleet when a new engine is received. Chief Miguel has proposed donating the surplus engine to the Recruit Candidate Academy at Utah Valley University. Mountainland Association of Governments (MAG) is presenting on third quarter funding in relation to airports and transportation taxes overall. MAG is the regional transportation planning organization for Utah, Wasatch, and Summit Counties and may have funding resources available for airports. Provo City and Miss Provo have been partners in promoting Provo for many years, with the City providing limited financial support for the Miss Provo Organization, and a parade float to promote the City with the expectation that Miss Provo participants would ride in the parade. Since 2016, the City Council Office has been Provo City’s liaison to the Miss Provo Organization—a role that had previously been fulfilled by the Mayor’s Office. As a result, the Council Office budget includes funding for Miss Provo and the associated city float. This discussion will address support regarding regarding the Miss Provo pageant and their involvement with the Provo City float. These presentations are in anticipation of the budget for the next fiscal year. The Public Works Department will report on how they’re performing with their budgets and what they may need to accomplish their goals. This is a required annual report on the use of Utility Transportation Funds over the past year. Discussions on wastewater planning continue. The purpose is to inform the Council of upcoming decisions they’ll need to make regarding the Wastewater Treatment Plant. This appropriation is being requested due to construction of a new taxilane, hangar pads, and a parking lot, necessitating the installation of utilities to service the new hangar pads and new access road. Be Ready Utah holds an annual event to remind people to prepare for earthquakes and to allow individuals, companies, and organizations to practice earthquake drills. The Great Utah ShakeOut website has information on the event as well as a wealth of resources for those interested in participating. In the event of a real emergency, we would activate our emergency alert system to notify residents. This system enables us to provide you with critical information quickly in a variety of situations, such as severe weather, law enforcement activity, missing persons and evacuations of buildings or neighborhoods. When we issue a notification about a potential safety hazard or concern, you will receive a message on the voice or text communication methods that you have registered, such as your home, mobile or business phones, email address, text messages and more. You pick where, you pick how. Sign up here if you haven’t already. If you have already signed up, login and see what new alert options are available. 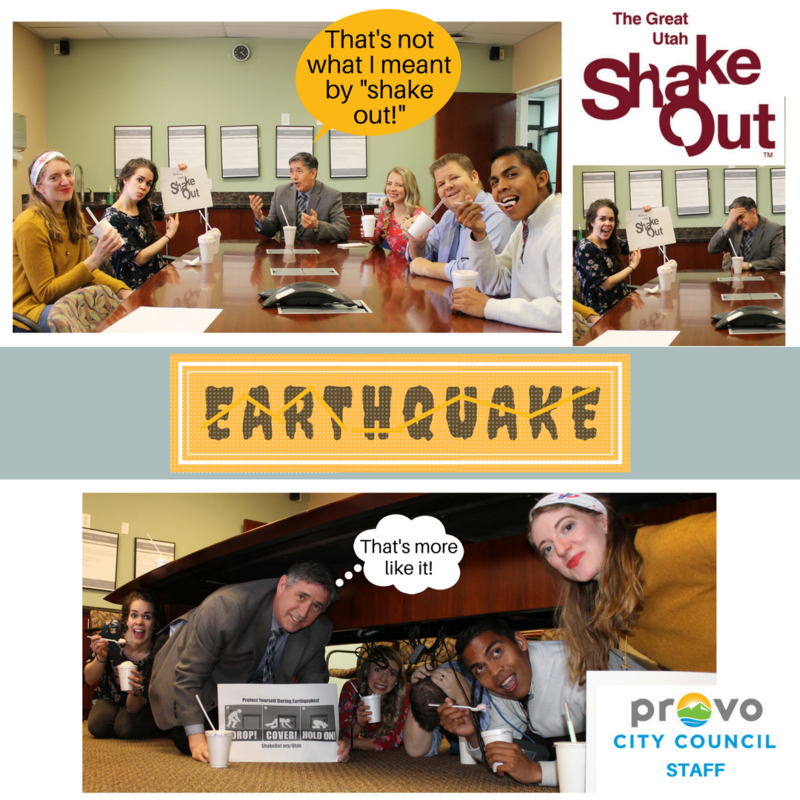 Our staff always finds a fun way to bring attention to the Great Utah Shake-Out! The approval of the minutes was continued to the April 24, 2018 Work Meeting agenda. 1. Consideration of a motion to place a resolution authorizing the Mayor to submit an application for a Utah County Municipal Recreation Grant to be used for Provo River Trail Renovations on the upcoming April 24, 2018 Consent Agenda. A motion to place this item on the Consent Agenda for the April 24, 2018 Council Meeting was approved 6:0, with Kay Van Buren excused. 2. A presentation on the Community Development Department and potential budget requests (18-005) Presentation only. 3. An update on zoning enforcement results (18-042) Presentation only. 4. An update on advertising efforts regarding the new rental ordinance law (17-104) Presentation only. 5. A presentation on the Mayor's Office and potential budget requests (18-005) Presentation only. 6. A presentation on the Council Office and potential budget requests (18-005) Presentation only. 7. The Municipal Council or the Governing Board of the Redevelopment Agency will consider a motion to close the meeting for the purposes of holding a strategy session to discuss pending or reasonably imminent litigation, and/or to discuss the purchase, sale, exchange, or lease of real property, and/or the character, professional competence, or physical or mental health of an individual in conformance with § 52-4-204 and 52-4-205 et. seq., Utah Code. Video recordings: Work Meeting and Joint Meeting. 1. A presentation to Bryce Mumford for five years of service award. A motion to place this item on the Action Agenda for the April 24, 2018 Council Meeting was approved 5:1, with David Harding opposed and George Handley excused. A motion to place this item on the Consent Agenda for the April 24, 2018 Council Meeting was approved 6:0, with George Handley excused. 5. An update on the Victim Services Grant (18-028) Presentation only. For more than two years now, the Provo City Council has had zoning compliance as one of its top priorities. As Provo continues to grow, the Council is faced with the challenge of ensuring that our residents still enjoy that feeling of home. In November 2017, the Council adopted an ordinance about rental law. Since that time, Council has revisited the ordinance and made some revisions. The hope is that the new requirements would educate tenants on the occupancy restrictions while making sure that landlords are aware of the number of tenants living in the residence, leading to better compliance with Provo's zoning laws. This change directly impacts those who rent out residential space in Provo or those who are residential tenants in Provo. The effective date is August1, 2018, and we want to give you time to prepare. 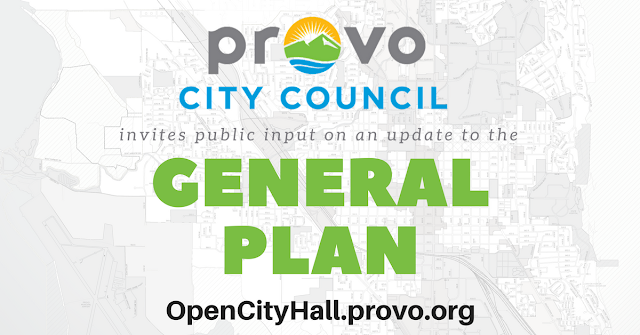 Provo City's General Plan is in need of an update and the City Council would like your input. The General Plan is a broad planning guideline for the City's future development goals and provides policy statements to achieve those goals. The General Plan is the foundation for establishing goals, purposes, zoning, and activities allowed on each land parcel to provide compatibility and continuity to the entire region as well as each neighborhood. Visit Open City Hall. Take a look at the draft that we've put together. You can read the text inside Open City Hall or download a PDF for each chapter. Tell us your opinions and suggestions. Let us know if we are on the right track for guiding Provo's future development. This draft will be open for comments until noon on April 30, 2018. 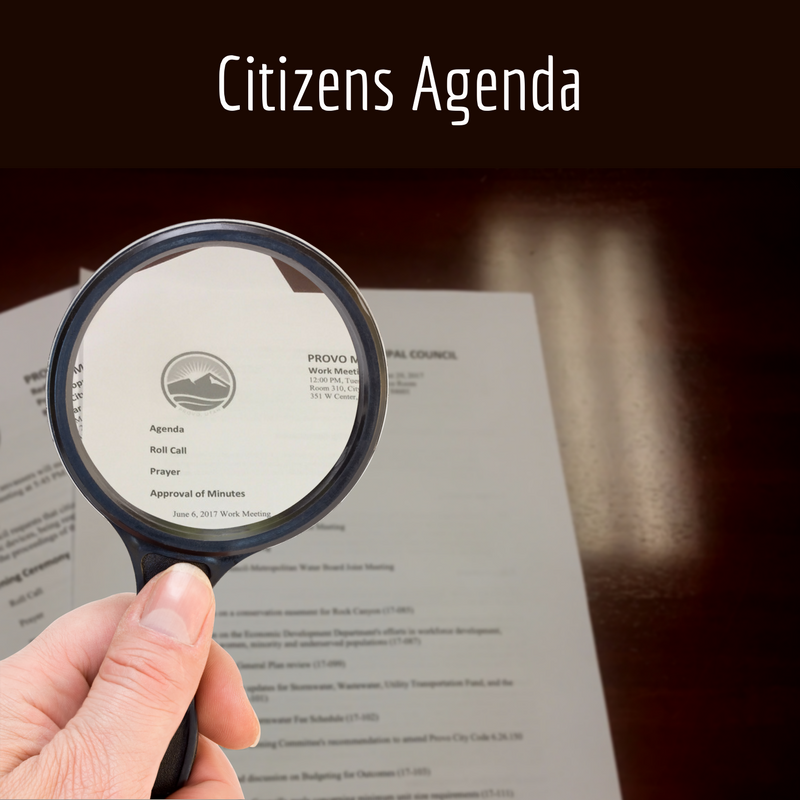 Registered users of Open City Hall can return and make edits and additions to their comments until that time. Bryce Mumford is being honored for reaching over five years of service as a policy analyst in the Council office. The Economic Development Department will provide an overview and proposal for a potential sales tax increment agreement with owners of Days Market, located on North Canyon Road, in order to provide retail incentive to offset certain costs associated with a $1 million remodel with the hope of doing additional work within the store not covered by the construction loan. This would bring City Code in line with a 2017 change to Utah State Code defining proximity restrictions for alcoholic beverage licenses and where they will be granted within specific proximity measurements to a community location (church, school, etc.). 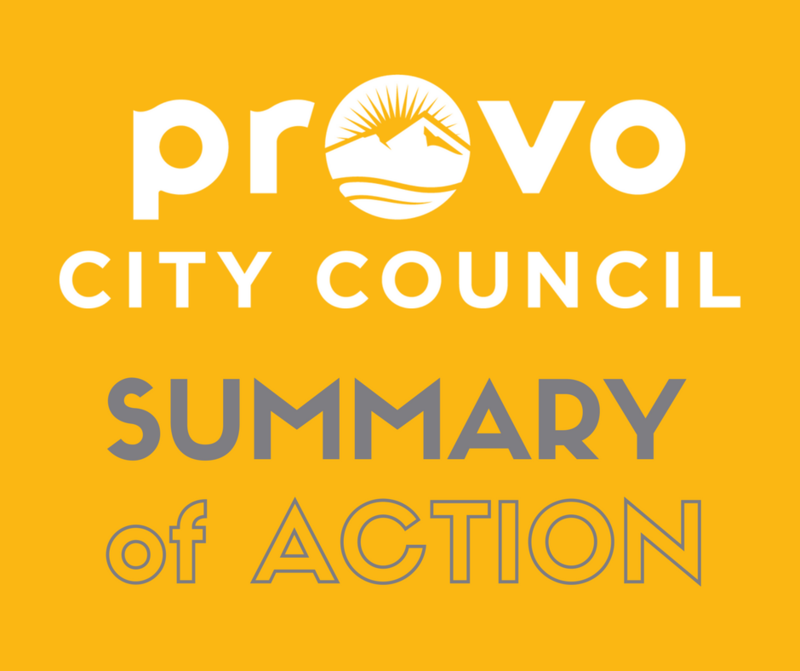 An update on the activities of the Provo Bicycle Committee. The Provo Police Victim Services Division is mostly funded by local, State, and Federal grants. They are required (as part of the grant) to provide the Council with two updates per year on the grants. Neighborhood chairs felt that the noticing process for different steps in the development approval process needed some updates and clarification. 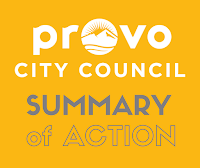 To address this, a Council subcommittee, formed from members of the Development Approval Process Review (DAPR) Committee, would like propose changes to Provo City Code Chapter 2.29.040 (Neighborhood Program), 14.02.010 (Zoning), and 15.17.040 (Land Use and Development). The changes will address when neighborhood meetings are required, the amount of noticing required of the developer, and the process for moving the application to the Planning Commission agenda.